Oakland University Art Gallery opened an exhibition, The Berding Memorandum, on September 15, 2016, with a collection of abstract expressionist work by Thomas Berdling, Professor of Studio Art at Michigan State University. His abstract expressionism has obliviously evolved over several years where earlier work has more reference to the real world, be it landscape or figures. While his work is not a literal translation, there is no mistake the paintings are a response to a particular situation, often referenced in work’s title. 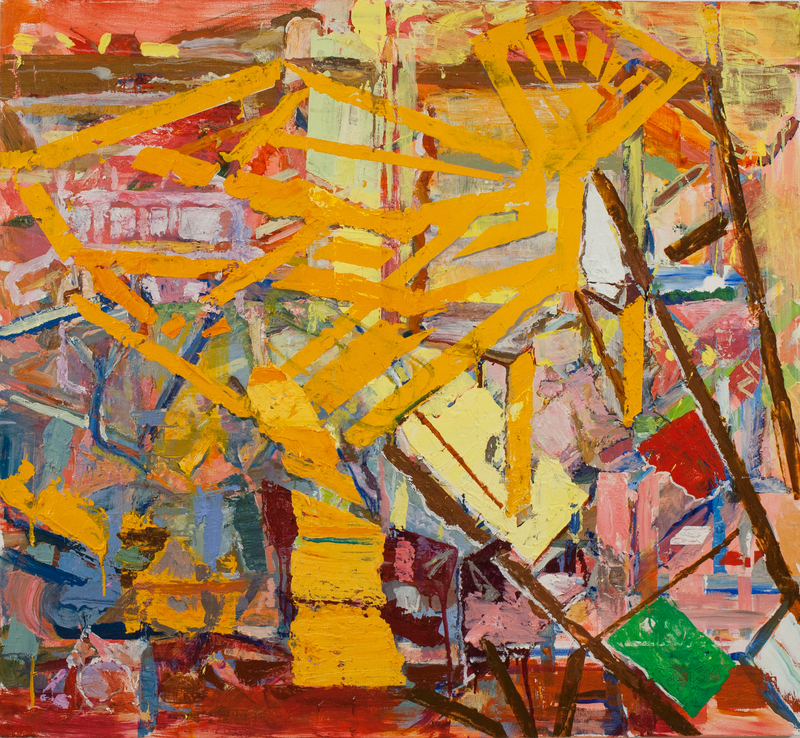 An example is the painting Command Tree, 2013, where you find a reference to an orange-yellow tree that comes forward dominating the composition over a re-shuffled landscape with background structures. Abstract Expressionism, born in the mid-1940s and lead the way for ten years as part of the New York City art scene, made a deep and lasting impression on artist Berding’s age group. It’s not hard to see the remnants of early Pollack, de Kooning, and color similarities with Matisse in Berding’s work. 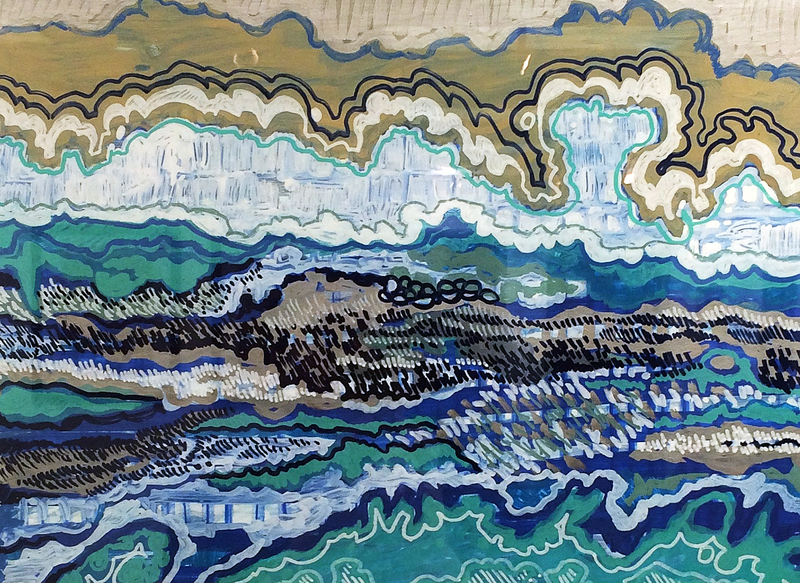 In the work Breakage, we experience a landscape that has a busy foreground, making way to a mid-ground of larger shapes, and upward to a sky with transparent building like shapes. His tools are less brush, and more palette knife and tape removed. 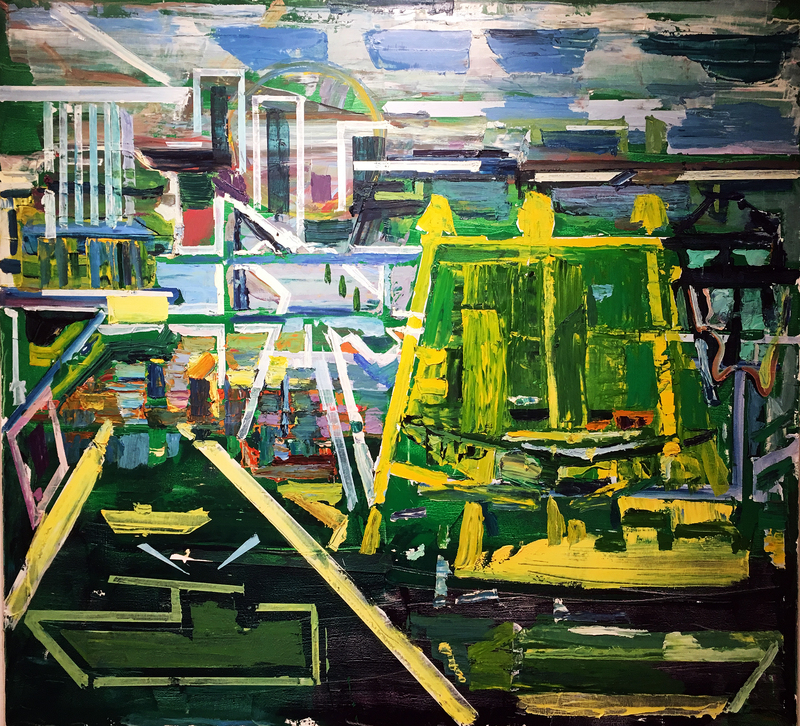 Through out his work there is a unified effort to create a color feel, often a thematic color arrangement for a particular painting where a sense of mapping, charting or sorting is taking place. Many historians feel the AE period was cut short as society sped towards change that was mirrored in daily life of the 1960’s and embraced Pop Art, Minimalism, and later conceptual art that thrived on installation. Looking back over the millennium, movements in art typically lasted longer, and this could be why artists of a certain age still want to explore the qualities they relate to in abstract work as if to say, the period wasn’t yet finished. With a palette dominated by green in Land and Sky, this abstraction seems to have an elevated point of view, as if the viewer is located high across the river overlooking the cityscape that leads to a horizon of buildings. The converging yellow shapes create an unreal type of perspective that takes the eye back towards the mid ground of complex color and shape. Richard Diebenkorn started out as a realistic artist, and gradually became an abstract painter that used the landscape in the 1950’s to create his Ocean Park series that depended deeply on his dependence with the local landscape. Here too, Berding give us his distinctively intense yet aloof rendition of his landscape experience, producing an ambiguous degree of abstraction that makes us wonder where he is going with this personal pandemonium? In a gallery full of smaller square 24 X 24” work, we experience a work process that some would describe as studies. Here in Turning Tables, Berding gives us a painting that shares a sensibility with Matisse, both in using shape and color. Because smaller work can move along faster, it might be that the artist is using this process to become more spontaneous and intuitive with his internal tools. It’s as if he has said to himself; I need to loosen up and work a bit faster, at least conceptually and see where it goes? 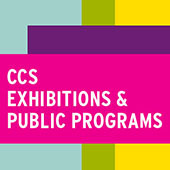 Thomas Berding, born in Cincinnati, Ohio and received his MFA from the Rhode Island School of Design, has been recognized with awards from the National Endowment for the Arts, Pollack-Krasner Foundation, and over his career has exhibited in many venues through out the mid-west. He has obviously been educated and influenced by modernism with its reductive style, drawn to abstraction, resulting in a personal narrative that expresses a kind of controlled explosion of color and shape. 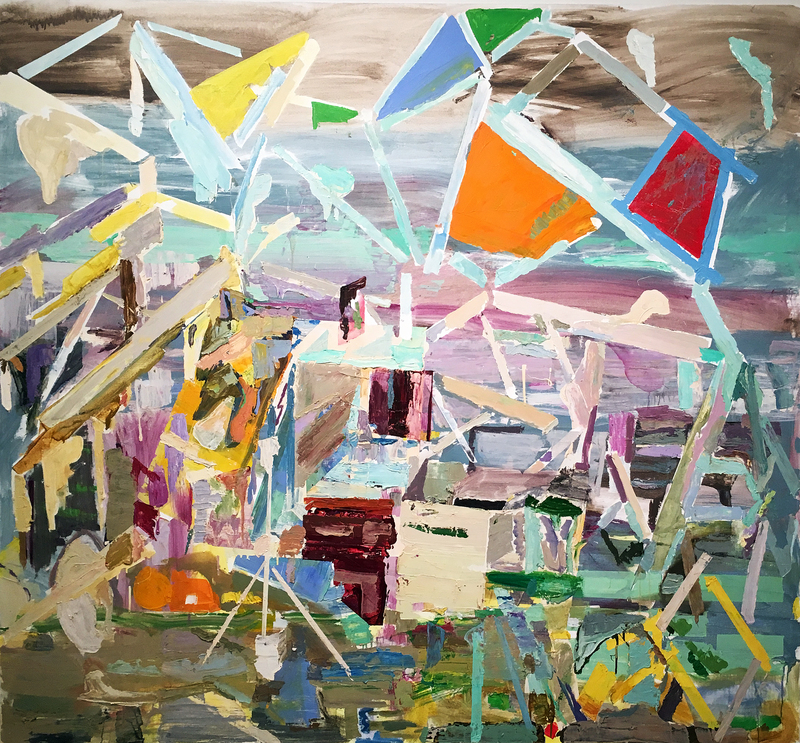 For those living in the Metro Detroit area, the OUAG provides their students, and us with a fresh experience in the abstract expressionistic work of Thomas Berding. 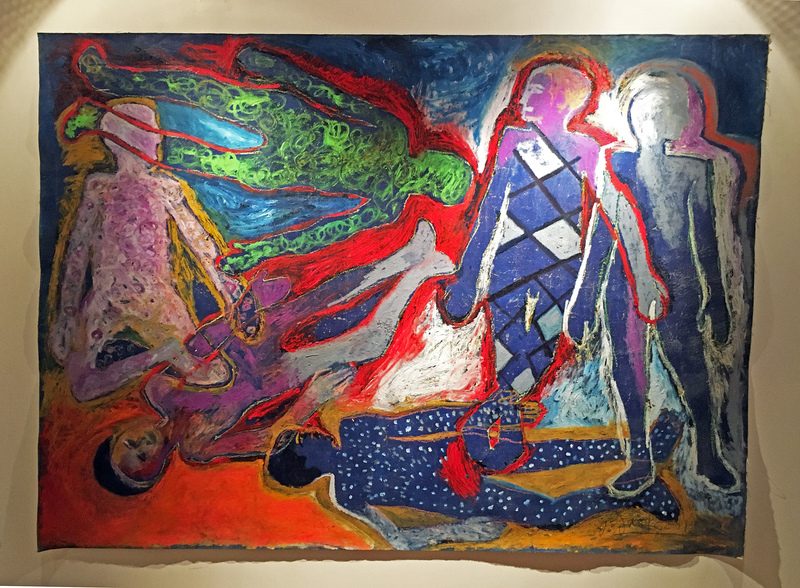 In the hallway outside of NCA Gallery, housed in a vibrant Community Center in Northwest Detroit, you encounter the first wave of Senghor Reid’s solo exhibition Diabolique. 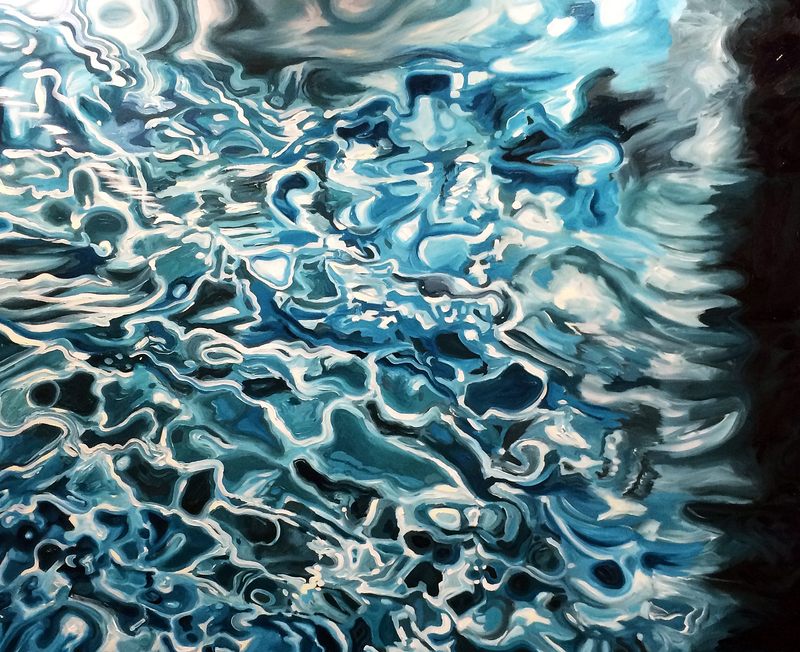 The imposing group of large-scale acrylic paintings depict shifting, shimmering surfaces of water in different weather conditions and light. Reid’s dynamic, disquieting treatment of the ever-moving element of water recalls David Hockney’s pool paintings. Both artists weave water as a substance in movements and marks that eerily echo the nature of the element itself- slashes, splotches, dense, doily-like layers of marks that begin to suggest forms even as those forms collapse and drain away before your eyes. Reid’s work evokes Hockney’s, also, in the strange, visually transmitted metaphor presented by both artist’s treatments of this element- that of the complete unknown, the otherworld that mirrors and impacts our own, that lies just beneath the surface. 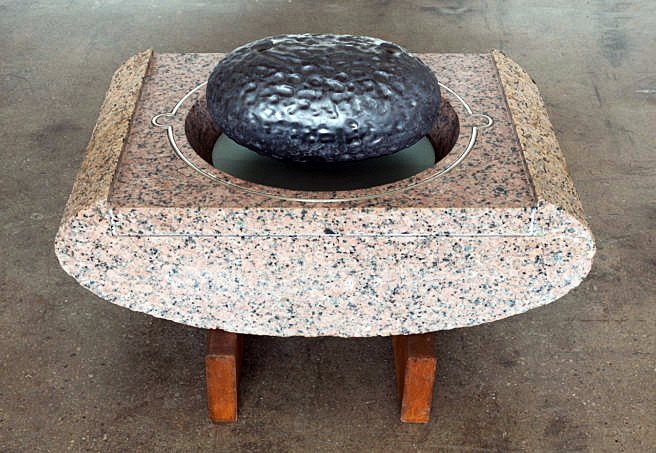 The title of Reid’s exhibition, Diabolique, references the 1955 French film Les Diaboliques, the plot of which revolves around the concealment of a corpse in a body of water. The water swallows the corpse and refuses to yield it up- it appears later, brought uncannily back to life, rising from the waters of a bathtub. The mysterious, treacherous capability of water to give both life and death, to absorb evil only to reveal it later in the most intimate settings, is examined with a plethora of materials and media, through scientific and aesthetic lenses, in Diabolique. 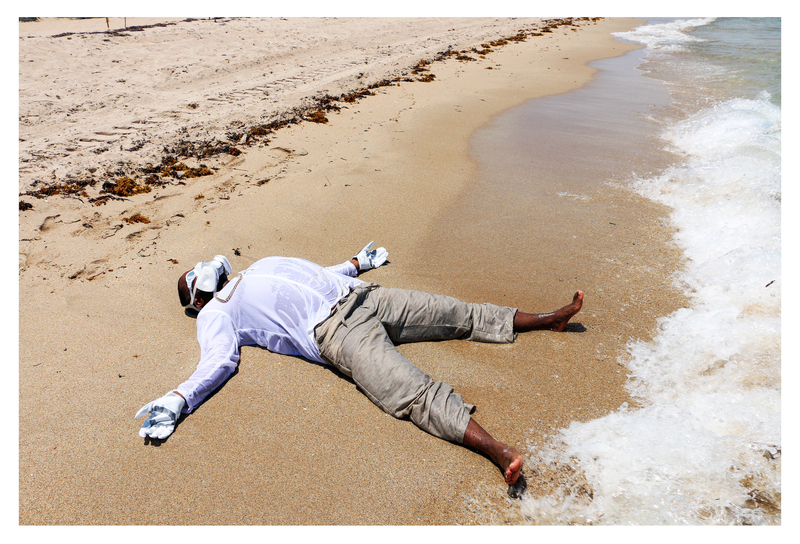 True to the origin of its title, the exhibition features a series of self-portraits of the artist washed up on a vaguely tropical shore, an uncanny, amphibious humanoid, his face concealed behind swimming goggles and a gas mask that suggests both survival in a toxic environment and gills. The figure of the artist appears both resurrected and consigned to dwell forever in conditions his body was not designed for. This could be seen as the fate of humanity at the dawn of the Twenty-first Century- our surroundings are now rife with invisible, and not so invisible, contaminants that have resulted from our misuse of the natural world. 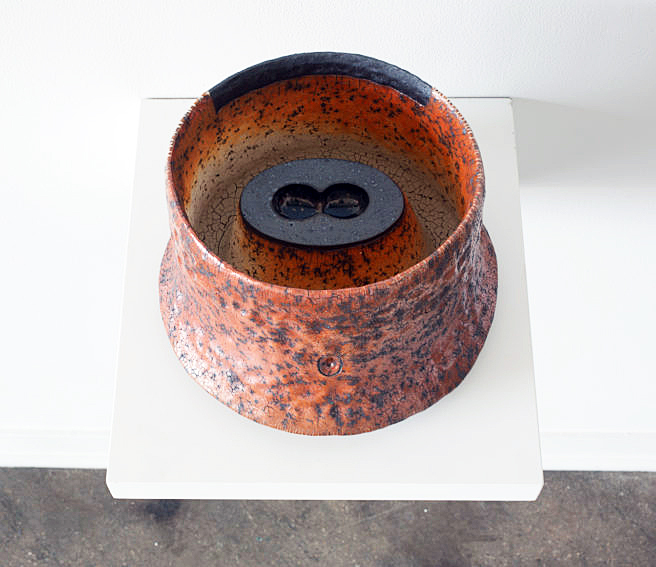 Reid uses the element of water as the aesthetic touchstone of his exploration of those harmful elements, and their insidious presence in our daily lives. The most sinister elements on the periodic table- mercury, cobalt, lead- are carried into our communities and bodies through the vehicle of water. These same elements, like water, are aesthetically beautiful- possessed of a seductive, ever-shifting sheen. 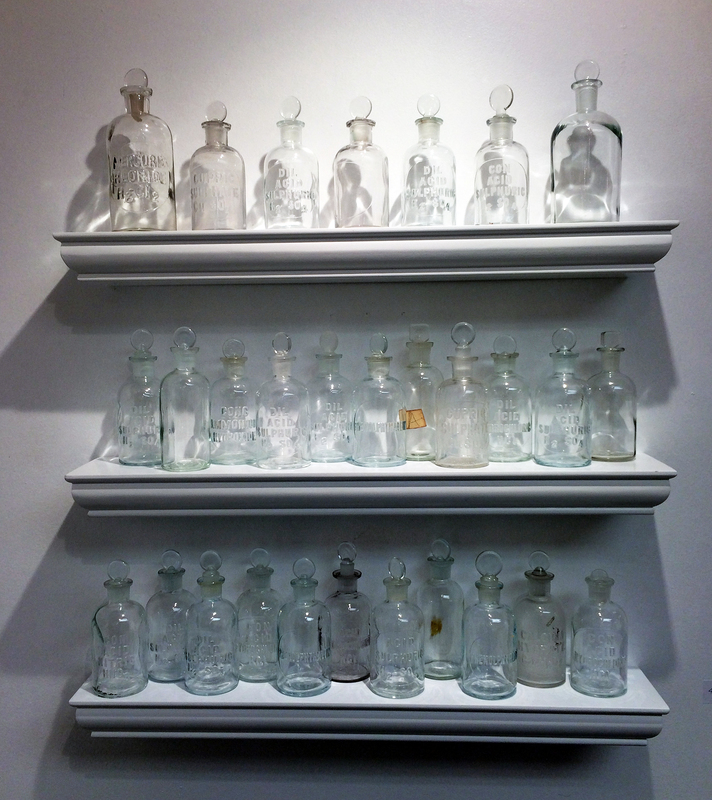 That paradox of beauty, vitality, nature and toxicity is presented in every one of Reid’s works, the large-scale water paintings, the smaller water studies executed in oil pastel and paint marker, the sensuous prints on gold and copper paper, the installation of crystalline vintage bottles labeled with the acids and heavy metals they once held. The shimmer, and Reid’s capture of it in almost every medium imaginable, wreathes an elegant, fragile dialog between art, science and nature in Diabolique. It is the surface of water, which has become so loaded (the Flint water crisis and Detroit’s ongoing scandal of water shut-offs are only two examples of the element’s presence in crises of health, politics, race, and class) with essential and unanswered cultural urgencies. It is the glint of heavy metals, and the faceted surface of glass, containers and transmitters for elements that delight our eyes and leave putrid, invisible traces. It is deep, lurid, sensuous hues that sing of our love of nature as they paradoxically poison our environment. The shimmer conceals the corpse that will, inevitably, rise up from the murky inheritance of our chemical-spewing forbears. The rest of us may not be so lucky- yet, Diabolique seems to suggest, where there’s beauty, there’s hope. 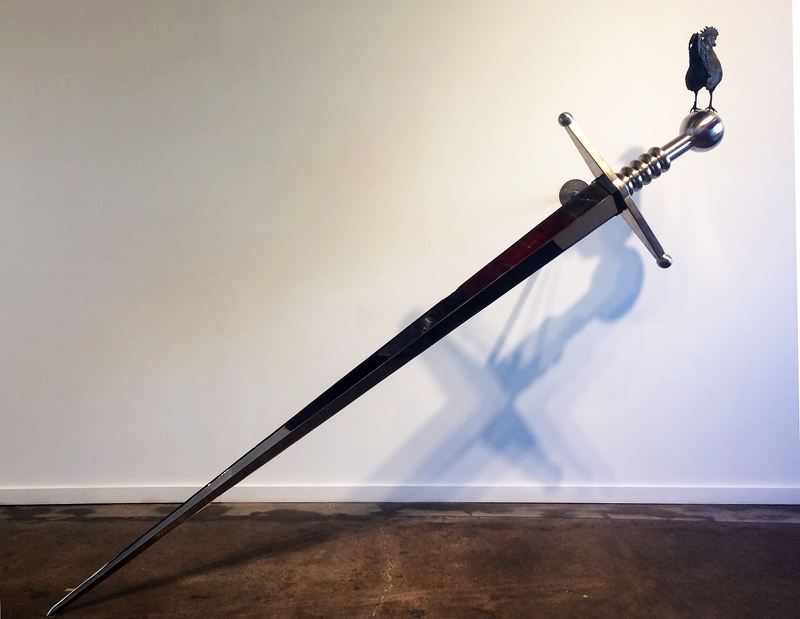 Diabolique, by Senghor Reid, at NCA Gallery through October 21, 2016. As Wasserman gallerist Megan Keeley reminded me while walking me through “Energy/Mass,” the scientific aspect of the show is hardly trafficking in cutting-edge research. The science of “Energy/Mass” is pretty bare-bones, accepted knowledge of biology and genetics- the processes by which organisms (in this case, chickens) reproduce, and the results of introducing new material into an isolated genetic pool. What “Energy/Mass” explores is a lyrical, artistic interpretation of that long-studied process. 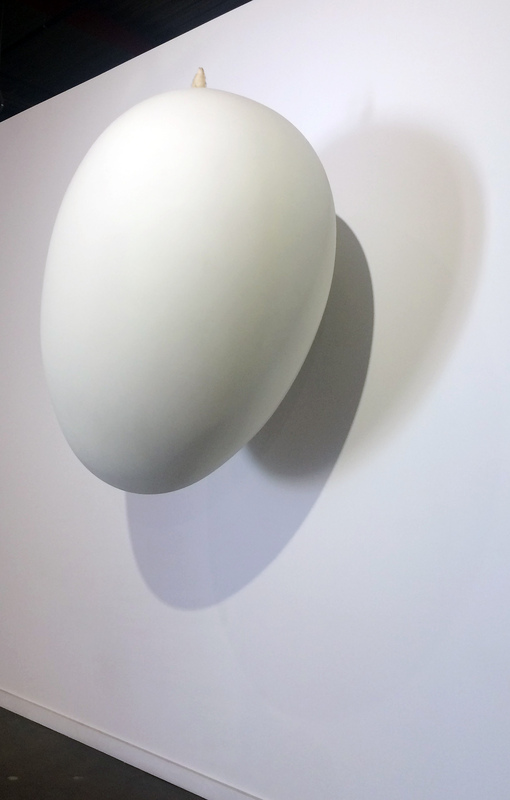 The work in “Energy/Mass” presents an aesthetic exploration, backed up by intensive research and field practice, of the processes of reproduction, the surprisingly graceful allegory these processes present for social, historical, and artistic practices, and the vital role visual art can assume in the binding and bridging of disciplines- biological, historical, social, political, and aesthetic. “The Cosmopolitan Chicken Project” centers on the breeding of chickens. 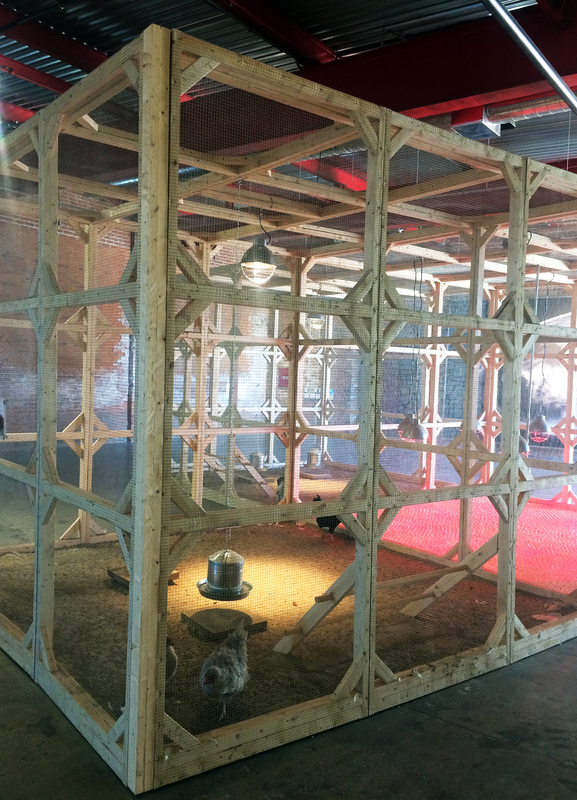 A large coop inhabited by live chickens dominates the exhibition, and exposes its beating heart. Being serenaded by roosters while wandering through a gallery is an unusual experience that made me wish I could incorporate audio into this review. 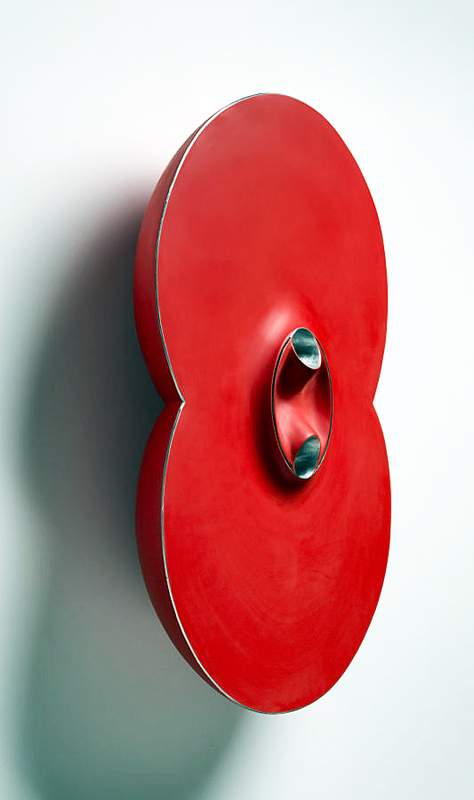 Vanmechelen chooses his breeding combinations based upon human-made geographical boundaries. This illuminates the impact of historical nationalism/xenophobia/political activity of humans upon the processes of natural selection and genetic descent. Apparently, we require the flora and fauna within our geographic boundaries to reflect those boundaries as much as our history and politics do. What results, manifested in regional livestock, is, in the context of this body of work, almost numberless distinct breeds of chicken, each iconic of its geographic region. 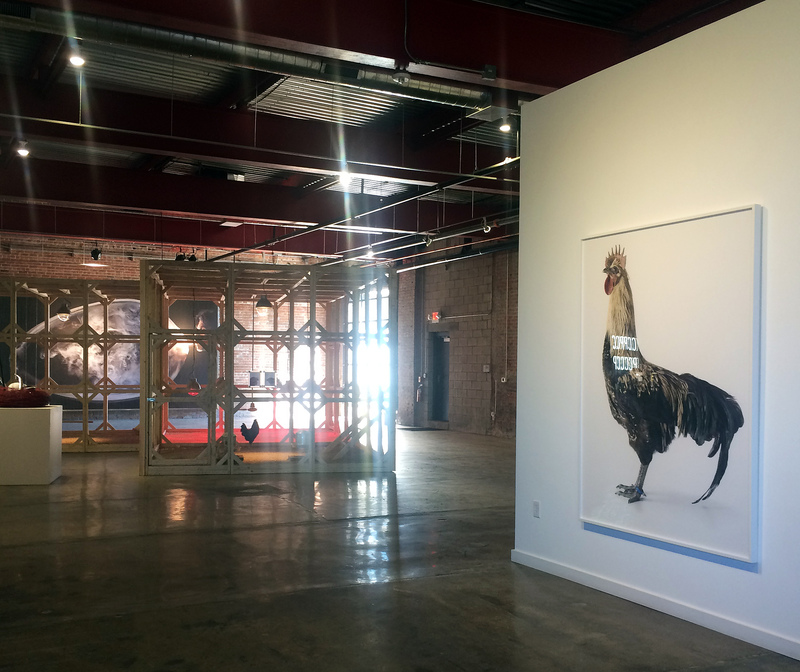 Vanmechelen’s “Cosmopolitan Chicken Project” is now in its twenty year generation. It has leapt, genetically, from country to country in a migratory pattern that echoes the migrations of humans from one culture to the next on our journey to globalization. The documentation of this fertile chain- from Europe through Asia, Africa, Australia and into the Americas- is displayed in “Energy/Mass” in works encompassing painting, sculpture, and mixed media incorporating taxidermy (all of the physical specimens that find their way into Vanmechelen’s body of work lived long, healthy lives on his incredible farm in Belgium, and died natural deaths prior to their incorporation). These lyrical, aesthetic explorations of the sublime subject of birth and reproduction are backed up with huge, red leather-bound volumes filled with indecipherable genetic codes that strike the layman as obscure, and essentially aesthetic, as the more specifically visual works. This work distills geographic migration- a process which bonds and strengthens- a powerful reminder for us in these strangely xenophobic times. When so much of our political discourse revolves around fear of the other, penetrating our shores, muddying our genetic pool, this work presents a simple, undeniably scientific truth- that cross-breeding, introducing new elements into a long-established system, can only empower. 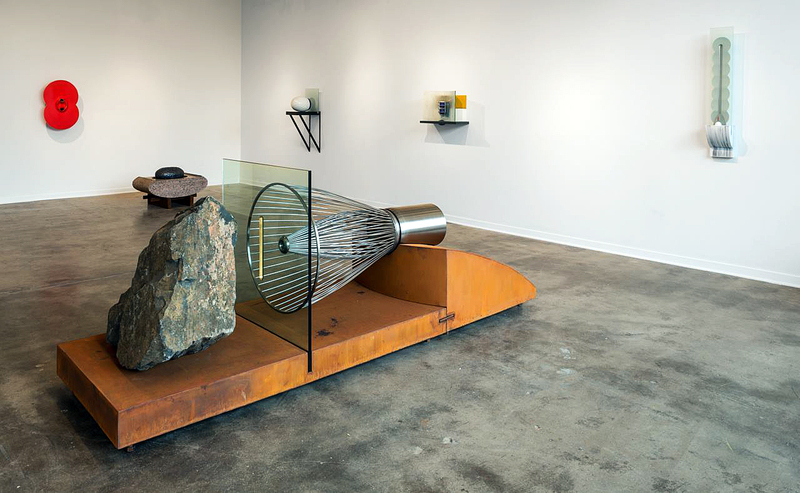 “Energy/Mass,” A solo exhibition of work by Koen Vanmechelen, is on display at Wasserman Projects through December 17, 2016. 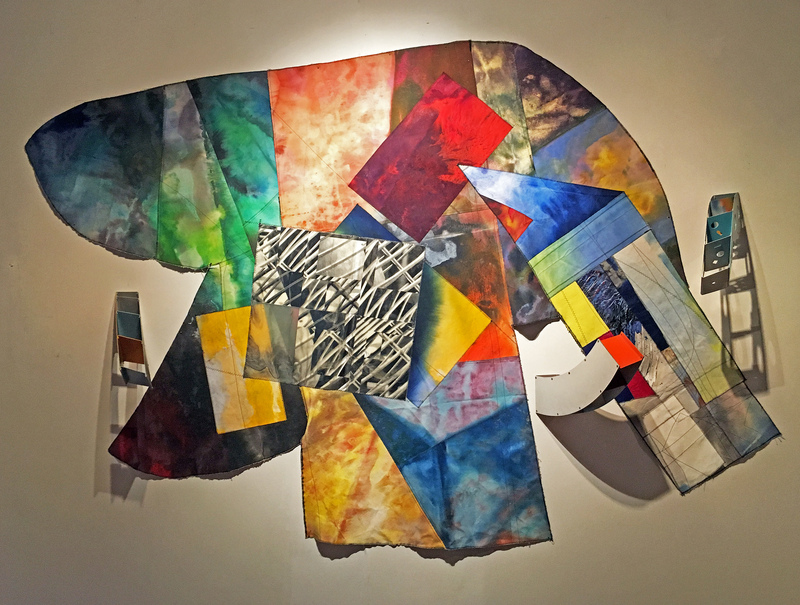 George N’Namdi opened the current exhibition, 35 Years in celebration of all the N’Namdi galleries since 1981, when he opened his first gallery, Jazzonia, on Harmonie Park in downtown Detroit. I remember that location because the Detroit Artist Market was on Randolph street and myself, and many friends were part of those DAM exhibitions. This exhibition features works collected by George N’Namdi before and after 1981, which includes over 40 artists spanning many genres and mediums. Educator and art dealer, George R. N’Namdi was born September 12, 1946, in Columbus, Ohio. He attended Columbus East High School in 1965 and went on to graduated from Ohio State University in 1970, before obtaining his Ph.D. in psychology from the University of Michigan in 1974. This exhibition brings together a small selection of work that has been represented in the gallery for a span of near forty years. 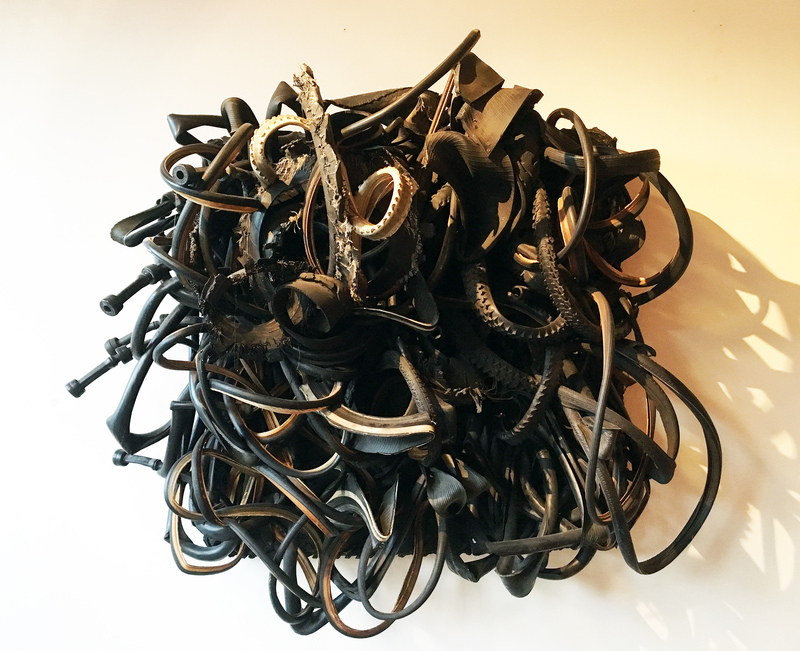 Known for her sculpture made from rubber, and her wearable sculptures, Chakaia Booker was one of the artists supported and exhibited by George N’Namdi in the early eighties. 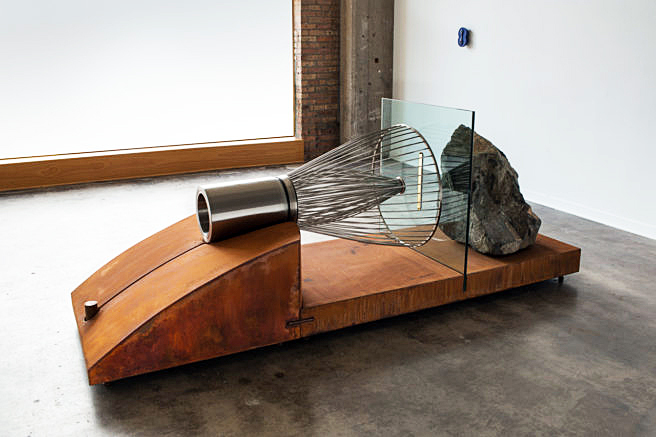 Her work “Echoes in Black, ” was accepted into the Whitney Biennial in 2000. The successful artist exhibits her work at the June Kelly Gallery in New York City and has work in the collection of the Metropolitan Museum of Art. Born in Chicago, Gerald Jackson gained notice when his work was included in two influential 1970s exhibitions–the 1970 Afro-American Artists: New York and Boston at the Museum of the National Center of Afro-American Artists, Boston, and the 1971 Black Artists: Two Generations at the Newark Museum. Jackson’s Island People is a figurative expressionist work from 1985 where the work outline of figures overlaps within a flatten picture plane. Al Loving (1935–2005) was an Abstract Expressionist painter, and one of the few African American artists recognized for his contributions to the movement. 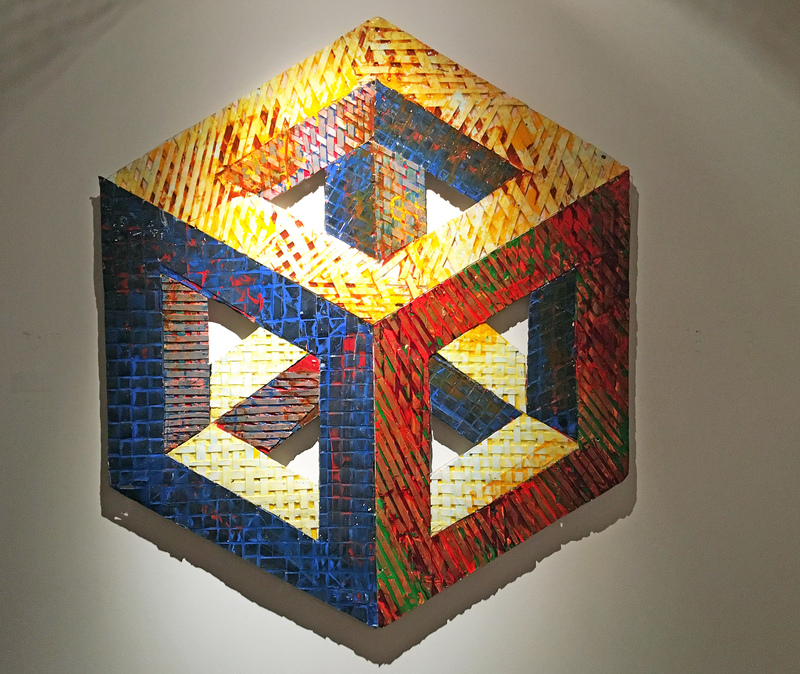 Born and raised in Detroit, he was known for his geometric work using bright color and hard-edge line in his arrangement of cubes and rectangles. Loving receive his BFA from the University of Illinois in 1963, and then his MFA from the University of Michigan in 1965, and soon after moved to New York City. In 1968, he had a solo exhibition at the Whitney Museum.